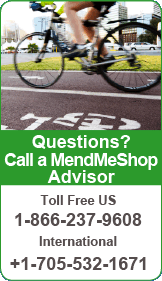 Quadriceps tendinitis (also spelled tendonitis) is a painful condition affecting the quadriceps tendon above the patella (kneecap). The quadriceps group of muscle (individually called the vastus lateralis, vastus intermedius, vastus medialis and the overlying rectus femoris) is the largest in the front of the thigh and is very important for stabilizing the leg. 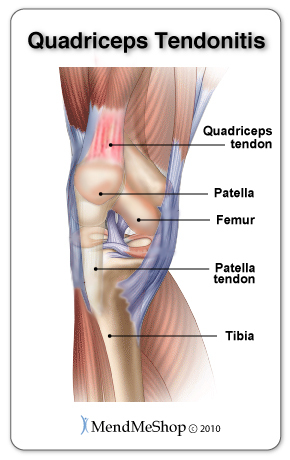 The quadriceps tendon connects the quadriceps to the tibia (shins) via the patellar tendon, which surrounds the knee cap itself. The movement of the knee known as the quadriceps mechanism involves the patella (knee cap), the patella tendon, the quadriceps and its tendon. They all work together to extend the leg to straight. Pain when tightening or flexing the quadriceps with a straight leg. The best way to treat quadriceps tendonitis is to start by resting your knee, especially avoiding the particular activity that produced the condition. 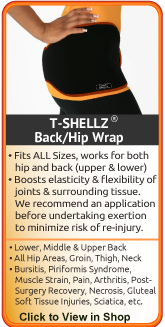 Regular cold compression wrap application, Deep Tissue Regeneration Therapy and gentle stretching and physiotherapy are all helpful. 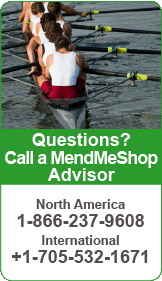 In the case of mild tendinitis, the body should be able to heal the tendon fibers normally with proper rest. Unfortunately, this is not the usual result, due to the injured tendon being used frequently in everyday activities. Because of this stress on the quadriceps tendon, the body heals the injured fibers by binding them together with fibrotic adhesions, or scar tissue. 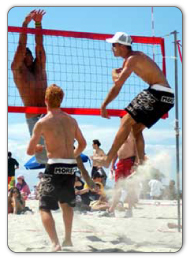 This is a normal, protective response of the body, done in an attempt to prevent further damage to the injured area. Unfortunately, this leads to inflexibility in the knee and possibly chronic knee problems. 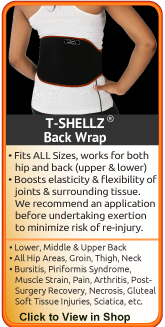 The trick to healing quadriceps tendonitis is getting it to heal with minimal scar tissue formation - something our T•Shellz Wraps are great at! Even with optimum healing there is always less elasticity in a previously injured quadriceps tendon. You need to make sure you heal this as best you can- that way, your chance of re-injury and chronic knee problems down the road is much lower than average. Using cold compression to treat quadriceps tendinitis reduces pain, swelling, and tissue damage. 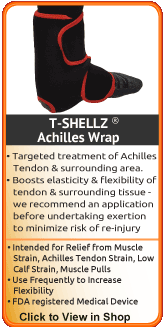 Cold Compression Therapy works by interrupting and slowing nerve and cell function in the damaged area. This is important because once blood vessels are damaged, they can no longer carry oxygenated blood to the quadriceps tendon and tissue cells begin to break-down. 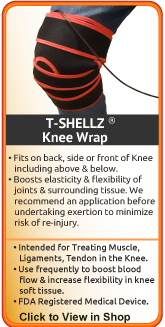 The Knee Freezie Wrap™ allows you to treat yourself in an effective and convenient way and rid yourself of the pain of quadriceps tendinitis above the knee. An ice pack or frozen bag of peas will help you minimize pain and swelling following a tendon injury. 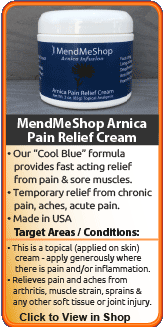 Cold works by interrupting and slowing nerve and cell function in the damaged area. This is important because once blood vessels are damaged, they can no longer carry oxygenated blood to the damaged tendon where cells begin to break-down. 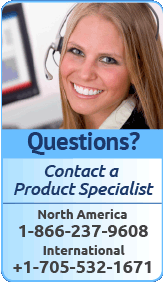 Cold temperatures slow cell function thereby reducing cellular break-down. 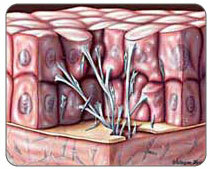 Furthermore, because the cold numbs the nerves, it will help reduce pain. 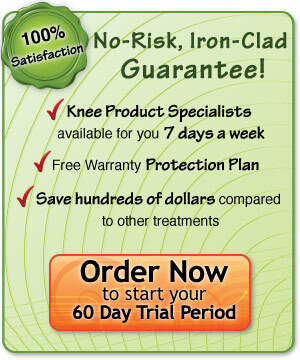 After the inflammation and swelling above your kneecap and around your quadriceps tendon is reduced, you can begin to treat your entire knee with Deep Tissue Regeneration Therapy, or DTR Therapy. DTR Therapy increases the amount of blood that flows naturally to your knee to nourish your tendons, ligaments and muscles and speed healing. By treating yourself with Deep Tissue Regeneration Therapy you can increase your body's blood supply to the knee and your body's natural healing power. In addition, the fresh blood flow whisks away dead cells and toxins that have built up from the tissue damage of quadriceps tendinitis leaving the area clean and able to heal faster. 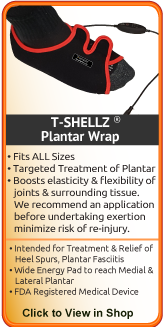 The Knee T•Shellz Wrap® provides the most effective, non-invasive, non-addictive pain relief and healing with no side effects. During your recovery, you will probably have to modify and/or eliminate any activities that cause pain or discomfort in your knee until your pain and inflammation settle. Taking the time to care for your knee properly will have your quadriceps tendon back to normal faster and allow you to get back to the activities you enjoy.